Please note that the content of this book primarily consists of articles available from Wikipedia or other free sources online. 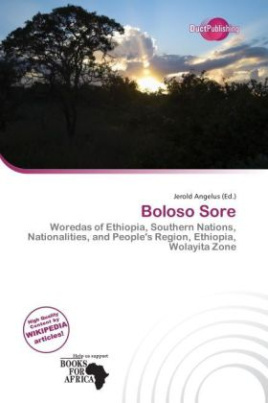 Boloso Sore is one of the 77 woredas in the Southern Nations, Nationalities and Peoples' Region of Ethiopia. Part of the Wolayita Zone, Boloso Sore is bordered on the south by Sodo Zuria, on the southwest by Kindo Koysha, on the west by the Dawro Zone, on the north by the Kembata Tembaro Zone, on the northeast by the Hadiya Zone, and on the east by Damot Gale. The administrative center is at Areka; other towns in Boloso Sore include Bombe Edget and Gununo Hamus Edget. Landmarks in this woreda include three megalithic sites with one stele in each; one of these sites is Cheme Hembico. Near the She'a river there is a site with animal engravings; obsidian and ceramic fragments have been observed on the surface of the She'a site.